BESTEK 1000W power inverter with dual AC outlets, can keep your digital electronics and household appliances running all the way during your trip. Convenient and compact enough, it is easy to take and use, minimize this the discomfort of the long distances with your whole family. The power inverter provides 1000 watts continuous DC to AC power and 2400 watts of peak power that can charge both low power and high power appliances charging requirement, bring car electronics into home. Dual 110V household outlets can deliver 1000W continuous power to keep it running for your laptop, TV, DVD players, game systems, microwaves, pumps, and other electronics. Automatic overload and low-battery shutdown features to protect your connected equipment. Built-in 3 external fuses and cooling fan, your devices can be protected from damage and keep your family away from electronic shock. A lighted power switch can intelligently tell the charging status with signals. The power splitter is sleek and slim with rugged construction, easy to carry on and store in bag or luggage, and sturdy enough to use in harsh environments lack of power, perfect for car trip, travel, camping, and working on road or in remote areas. 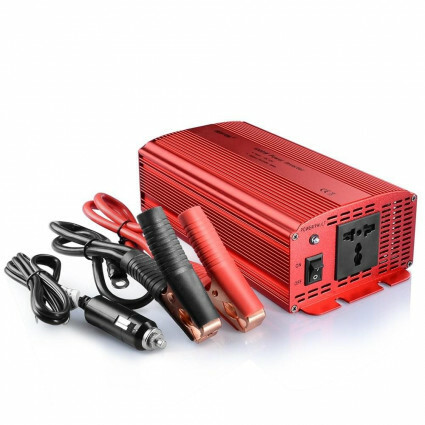 The power inverter is recommended to use the car cigarette lighter when electrical appliances less than 150W and connect to the battery directly when less than 300W. The car power inverter is normal for the inverter to become warm while you are using it. Avoid placing the inverter in direct sunlight or next to heat-sensitive materials.